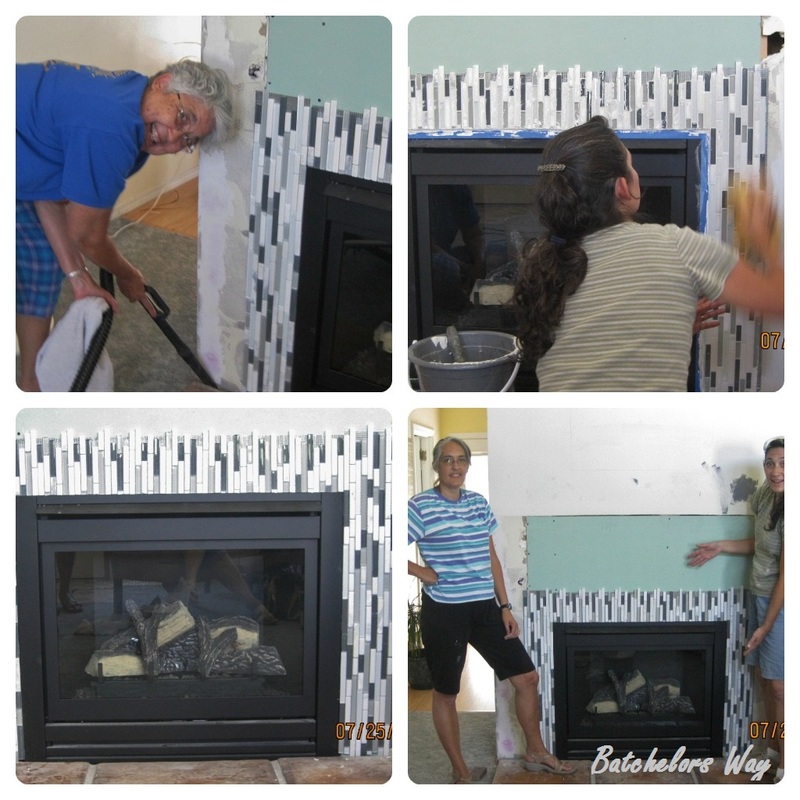 I know I already posted Nana's fireplace, but my mom found the pictures we took while tiling. I wanted to show ya in a little more detail about the Bondera we used. I would recommend using it for small jobs like this or a back splash. The only draw back is it is a little pricey. A 12" x 10' roll is about $40. But it saves so much time. and stuck it to the wall. Then we peeled off the protective film from the front. Then we stuck our tile to it. Once all the tile is in place we grouted! No waiting a day or two!! We did this hole project in one afternoon!! Next, was painting the fireplace wall grey. I wanted to make this skinny but tall wall pop! And it pops against the white mantel. Nana wasn't sure on this one but just went with me. 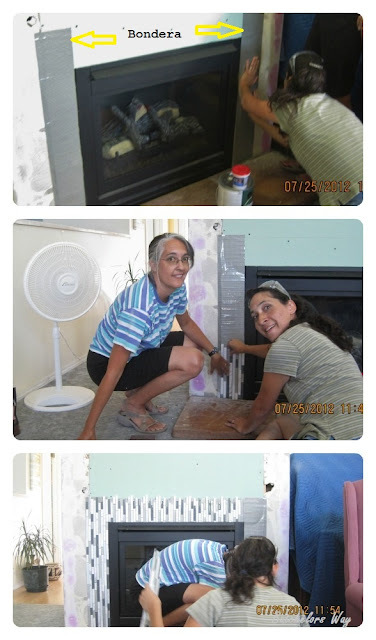 After we painted it and before the mantel was in we both got a little nervous. It seemed a little dark. 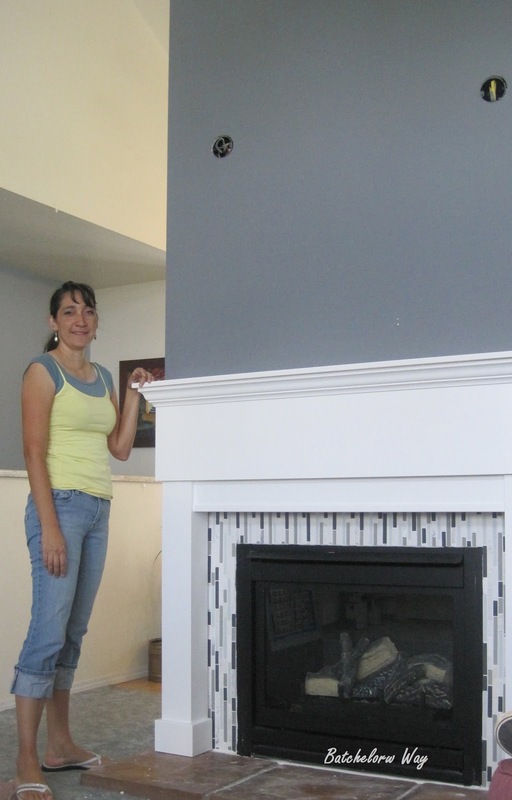 But once the mantel was installed it was awesome. The middle stages of a project don't always match the end picture in my head. But if I just trust my self they often end up great! 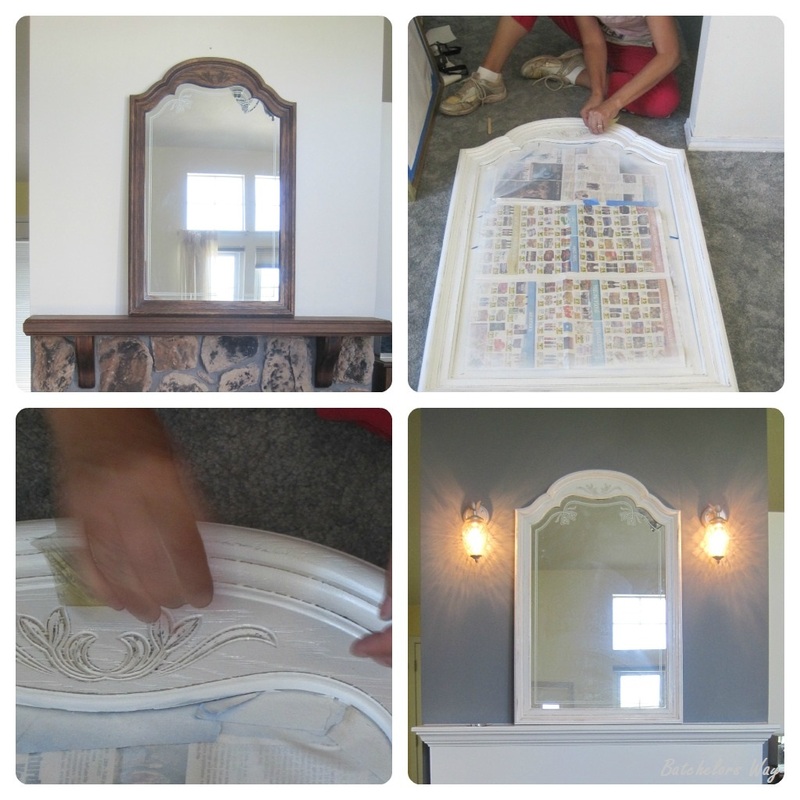 Here's a little more on the mirror above the fireplace. Nana bought this quite a while ago and really wanted to use it somewhere. I think we got it at Salvation Army. It's actually plastic faux wood. We just spray painted it white and distressed it a little. Nana isn't a fan of the distressed look. You might say she thinks it's ugly! But her mirror looked a little plastic all white. She hesitantly let me distress it just a little with the promise we could paint over it if she hated it. It made all the details show up more. She liked it so much she told me to go back and sand some more!!! Alright one last detail. Nana has clear glass in her sidelight next to the front door. When she moved in it had an old curtain mounted to the metal. Not only was the curtain not super beautiful but it blocked the light. We pulled it all off and patched the holes. Then we covered the window with textured window film. It totally lets the light in but blurs the view. I did the same thing at my house when I first moved in. You can get it in all different kinds of faux glass. We will be painting the rest of the room next!! I need to do my window next to the front door for privacy. Glad to know those products work!